This is the oldest theatre (EDIT: Read the Comments section below) on the Australian mainland. It is the Princess Theatre at 8 Annerley Rd Woolloongabba, and it was constructed in 1888 to a Classical design by architect John Nicholson for local land-owner and solicitor Phillip Hardgrave. It was originally known as the South Brisbane Public Hall, and then as the Boggo Rd Theatre. Boggo Rd was the early name for Annerley Rd, and is best known as the location of the infamous Boggo Rd Gaol. The building became the Princess Theatre in 1893. Originally designed to host live theatre, it was also used extensively for movies from 1914 through to WWII. Brisbane's early theatre companies were also using it at this time for live performances. 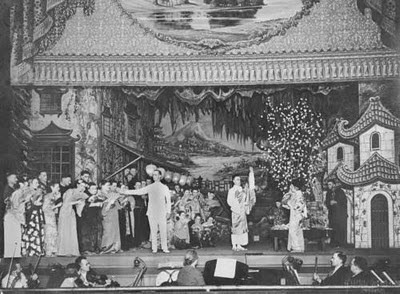 Here is a 1937 picture of a performance of Madam Butterfly by the Marie Knight Corkran Operatic Society. 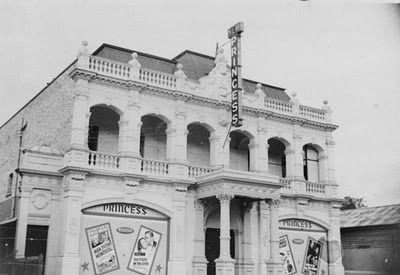 During WWII, the Princess Theatre became the headquarters of the US Entertainment Unit, and then after the war it was leased to a number of community organisations. Since then it has had varied uses, being leased such firms as an engineering company, an appliance retailer, a secondhand dealer and a paper manufacturer. It reverted to its original use when the TN! Theatre company acquired a lease in 1985. We are fortunate enough to have the building still with us, and it is still used as a theatre. Here is a link to its web pages, and below is a picture of how it looks today. My next post, scheduled for 6/6/10, starts "Two of the finest old theatres in Australia ... Theatre Royal in Hobart (1834) and Her Majesty's in Ballarat (1857). While I don't think Brisbane's Princess Theatre is the oldest in Australia or even on the mainland, I do think it has the most elegant exterior. Judging by the dates given by each venue, the Princess Theatre may be overstating its prominence. Apologies if I have led anyone astray; and thanks for the info Hels! I read that the Ballarat Her Majesty's theatre is older.